Jesus warned us that the devil only comes to steal, kill, and destroy (John 10:10). He called the devil a murderer and the father of lies (John 8:44). In the Book of Revelation, John called him an old serpent who deceives the whole world (Rev. 12:9). 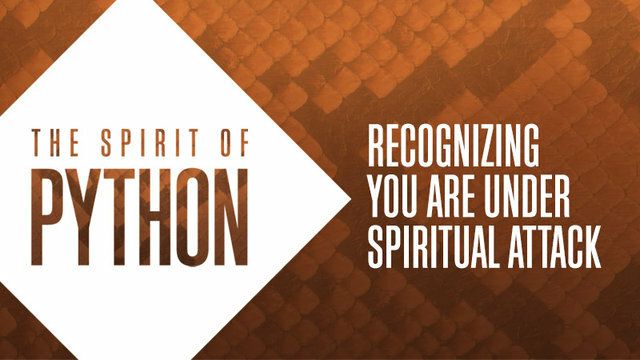 We’re doing a new series on Spirit of Python By Jentezen Franklin. These are a series of studies about being aware of who your enemy is and staying alert so that you may continue to live an abundant life. What is breath? God physically breathed into his nostrils the breath of life in Genesis 2:7. Jesus also breathed spiritual life into His disciples in John 20:22 when he said “Receive the Holy Spirit”. Just as we have breath that keeps our bodies alive, so The Holy Spirit is breath for our spiritual lives. In Acts 16:16, we find a specific spirit that was interrupting Paul on his way to prayer, which is called the spirit of python. When we look at pythons and what they go after, we realize that they go after breath. If we take this in spiritual terms, we can see that our enemy goes after our breath, because if we lose our breath we die spiritually. • You have a loss of spiritual desire. • You experience physical fatigue. • You have a weakening prayer life. • You feel overwhelmed and hopeless. • Old habits and lifestyle begin to resurface in your life. • You pull away from godly relationships. We must be alert to these warning signs. Jesus came to gave us life, abundant life. In John 10:10 says … “I have come that they may have life, and that they may have it more abundantly.” So you see, His desire for us is to LIVE our lives to the fullest—with much oxygen from the Holy Spirit, which is what the enemy is after. If the enemy takes away our prayer life, he knows that he has cut communication with our Father. If he can take away your hope, you’re bound to give up when hard times come. If he can take away your desire to worship and read the Word, he knows that you are soon to desire the things from this world, which lead to death. If you see yourself in this pattern that we’ve just described, you must identify those areas in your life where you have become weak. There are times where we go through challenges and we fell like we’re in the dark. But Jesus came to give you life and He wants you to breathe through the Holy Spirit. If you feel like your joy is being taken away, you may need breath to live joyfully once again. Be on guard [Read: Ephesians 6:10-18] and alert about these signs and don’t fall into spiritual death. God has given you powerful tools to fight this snake that is after your breath, PRAYER, THE WORD and PRAISE, use them!